KRASNAYA POLYANA, RUSSIA – Former NSA contractor Edward Snowden, who leaked a trove of classified documents to media outlets, further embarrassed the United States of America by winning a gold medal in cross-country skiing for Russia, with a time of 1:08:15.4. Marcus Hellner of Sweden won the silver, and Martin Johnsrud Sundby of Norway won the bronze. Snowden was whisked away shortly after the medal ceremony, escorted by several Russian security vehicles. American Civil Liberties Union attorney Ben Wizner, who is a legal adviser to Snowden, said Snowden wished to be left alone by the media and the fans, though he appreciates their support. 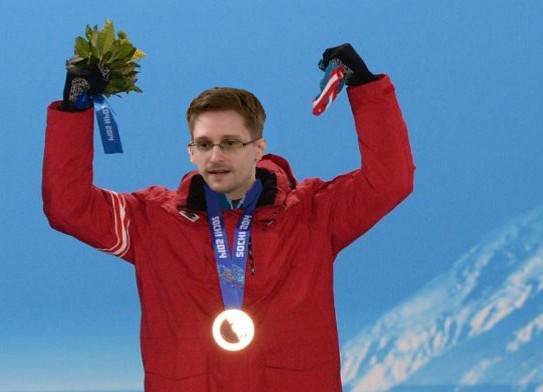 Snowden’s participation in the Sochi Games was kept under wraps, but had been the subject of heated rumor for nearly a week. Once his name was announced as a competitor, chaos erupted as reporters rushed to send their reports to their various news outlets and scrambled their photographers for better shots. White House officials say they were made aware of Snowden’s participation in the games shortly before 9AM Monday morning, when President Obama received a call from Russian President Vladimir Putin. The Russian leader said he didn’t want to embarrass Obama and the U.S. by having them hear about Snowden’s participation via news reports, according to Jay Carney, the White House Press Secretary. Asked whether the U.S. tracked Snowden back to his location, following the medal ceremony, Carney claimed not to be aware of any such action. “I’m not aware of us following him or tracking him, no,” Carney said. He then said that issue was closed, and the White House would have no further comment on it. As for Mr. Putin, he said that while he was concerned about what Snowden’s participation in the games would mean for relations between his country and the U.S., right now he was focused on Mr. Snowden’s victorious performance.